And here we are...the week of Christmas! Call me shocked because I have no idea how this year has come and gone so quickly. Besides that, I've only listened to Christmas music once this month, which was this weekend when I was making this peppermint fudge. I guess better late than never. Ever since I realized how easy fudge is to make, and how simple it can be to use one recipe as a springboard for other variations, I've been hooked on the idea of trying more varieties. Since it is the holiday season, I couldn't help but give peppermint fudge. I didn't think anything else would be quite as fitting. 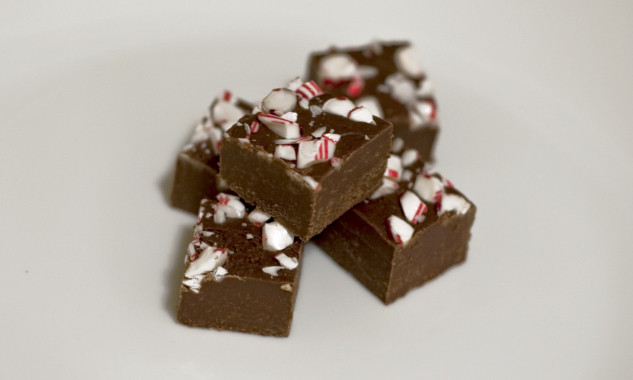 Most of the recipes that I stumbled upon were simple plain fudge with crushed peppermint on top. In my humble opinion, that is a copout. And isn't the point of making peppermint fudge so you can taste the flavors throughout? Not just in the few pieces of hard candy speckled on top. I used about 1/2 teaspoon of peppermint extract in my recipe. Depending on your taste, use more or less. You have a few days until Christmas Day, so run out to the grocery store for some last-minute supplies and head to your kitchen. The process does not take long besides letting the fudge harden in the refrigerator. Try it out and let me know your thoughts! Combine bittersweet chocolate, marshmallow creme, unsweetened chocolate and vanilla extract in medium bowl. Add sugar, sweetened condensed milk, whipping cream, peppermint extract and unsalted butter and stir over medium heat until sugar dissolves, brushing down sides of pan occasionally with wet pastry brush. Attach clip-on candy thermometer to side of pan. Increase heat to high and bring mixture to boil. Reduce heat to medium-heat and stir constantly but slowly with wooden spoon until candy thermometer registers 234°F. Transfer the fudge mixture to prepared baking dish. Smooth top of fudge in pan with rubber spatula. Sprinkle crushed candy cane over the top of the fudge, slightly pushing down into the fudge. Refrigerate the fudge uncovered until firm enough to cut, about 2 hours. Using aluminum foil as aid, lift fudge from pan. Trim edges of fudge. Cut into pieces.